Use this sheet if you would like to re-use an existing door or frame to confirm existing size and hardware locations. This is for confirming the door hand. 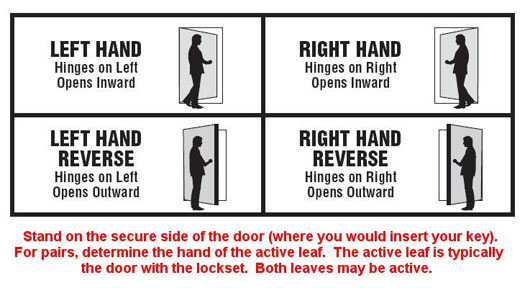 Very useful guide for door and frame installation as well as installation troubleshooting. Everything you ever wanted to know about designing a building key system, complete with easy-to-understand diagrams, glossary, and blank work sheets for creating your own system. Complete installation and parts manual for Total Door integrated door assemblies. Since 1968, Yadon Construction Specialties has been the first choice of customers in Washington and Northern Idaho. We are a full service provider of hollow metal doors and frames, wood doors, door hardware and many specialty products, including coiling doors, operable walls and accordion partitions. We are members of the Door and Hardware Institute (DHI) and the Construction Specification Institute (CSI). We also have four accredited Architectural Hardware Consultant (AHC) and Certified Document Technician (CDT) on staff.